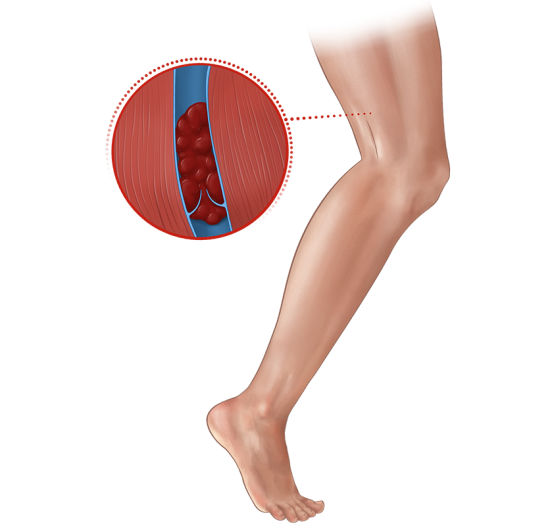 Deep vein thrombosis (DVT) is a blood clot that partially or completely blocks blood flow through a vein deep in the body, particularly the lower leg, thigh, or pelvis. DVT puts people at a higher risk of a pulmonary embolism due to the fact that a piece of clot can break free from its original location, travel through the bloodstream, and block blood flow to the lungs. Computed tomography (CT) scan uses a combination of X-rays and computer technology to produce images of the body. CT with contrast, a dye-like substance, enhances the image of the organ or tissue under study. Magnetic resonance imaging (MRI) uses a combination of a magnetic field, radio frequencies, and a computer to make detailed images of organs and structures within the body. Duplex venous ultrasound is used to evaluate the blood flow in the veins and to detect the presence and specific location of blood clots. During the test, the technologist applies pressure when scanning your arm or leg. If the vein does not compress, it may indicate a blood clot is present. Venography is used to examine the deep veins via X-rays. During the procedure, contrast is injected into the veins, making the veins, blood clot, and possibly blocked blood visible on the X-ray. Blood tests are used to check the blood’s clotting status. Other blood work may include testing for genetic disorders that may contribute to abnormal clotting of the blood. Oral anticoagulants, also known as blood thinners, are the standard treatment for DVT. These may prevent new clots from forming by reducing your body’s ability to clot. However, you may still feel the symptoms due to existing clot. Compression stockings are also recommended as part of standard treatment. These are prescribed to help reduce leg pain and swelling. Endovascular intervention is another option, one that may help prevent post-thrombotic syndrome (chronic leg pain and swelling). Treatment consists of one or a combination of two basic approaches to restore proper blood flow: 1) an injection of a clot-busting drug, and 2) mechanical thrombectomy, a minimally-invasive procedure that physically removes clot from blocked arteries.